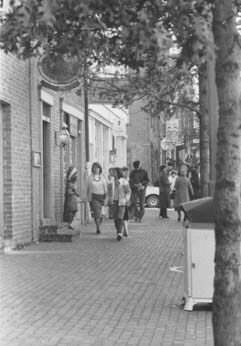 Lee Davenport and King Street, Alexandria, VA 1982. The second most important court case for street performers' rights started in 1982. 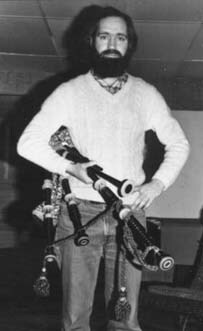 Lee Davenport, a mild mannered stay-at-home father, was arrested and fined for playing his bagpipe on King Street in Alexandria, Virginia. 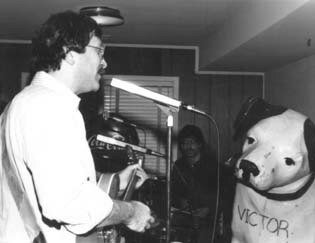 Attorney and Musician, Kenneth E. Labowitz with his band "Trade Winds" and RCA Victor dog. 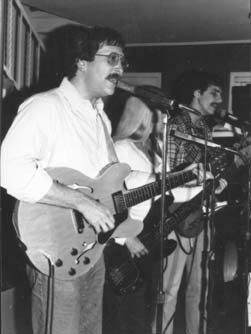 Attorney and musician, Kenneth E. Labowitz, took up the cause and then the court case took on a life of its own. The city attorney was once romantically involved with Lee Davenport's attorney, Kenneth E. Labowitz, which provided extra passion to the case. The city appealed the District Court judgment against them. One of the three Appellate Judges had died and the more conservative "senior judge" appointed a conservative replacement. The Fourth Circuit sent the case back to the District Court for more hard evidence by a 2-1 vote. The original District Court again ruled against the city based primarily on William H. Whyte's expert testimony of "ease of pedestrian flow and idea of self-regulating crowds." See the letter below and Rediscovering the Center City (Doubleday 1988) by William H. Whyte Read pages 32-39 for his description of street entertainers, the Davenport v Alexandria, VA and the Friedrich v. Chicago court cases. 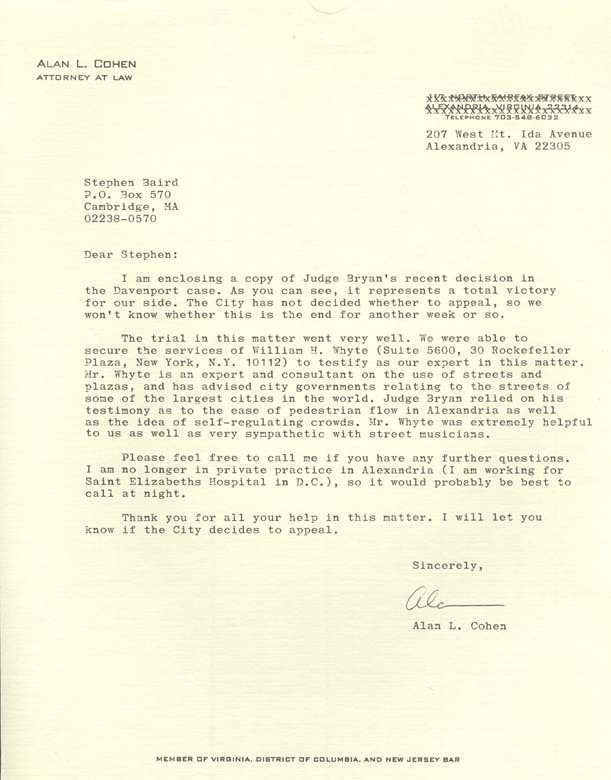 Letter from second Attorney Alan L. Cohen on the third Davenport court case. The city appealed the case again to a three Judge Appellate Circuit Court and lost. The case was appealed another time to the full nine Judge Appellate Circuit Court and the city lost again 8-1 along with all court costs. The Appellate court was unusually blunt and essentially told the city attorney to jump in the Potomac River. It was along and tedious battle. Very frustrating for Lee Davenport, who gave up performing. However, the cases did provided extensive legal precedence for street performers' rights. The three of court cases are available in digital format along with my historical researh statement.